Former Italian Prime Minister Silvio Berlusconi visited Sochi for Vladimir Putin’s birthday and presented his friend with a king-sized embroidered duvet, the Italian newspaper Corriere della Sera reported on Sunday. The bed linen company that stitched the present confirmed this information to RIA Novosti saying that it took about six hours to stitch the blanket cover. 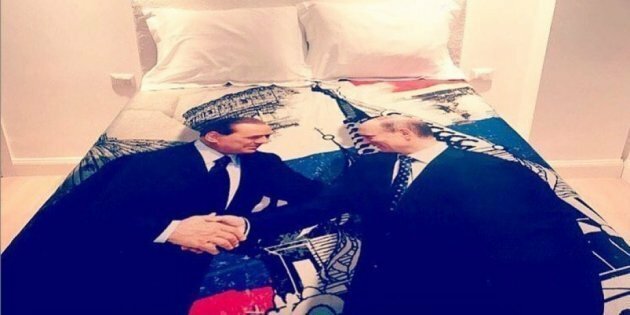 The duvet shows the two leaders Berlusconi and Putin shaking hands against the backdrop of famous sights of Russia and Italy, including the Cathedral of St. Basil the Blessed and the Colosseum. The Russian president celebrated his 65th birthday on October 7. Putin and Berlusconi have long-standing and friendly relations. They repeatedly visit each other during private and state visits. In late September 2015, Berlusconi visited Crimea and a few months earlier he had come to see Putin in the Altai Mountains where the Russian leader was vacationing. Happy Birthday Mr. President: How Well Do You Know Vladimir Putin?